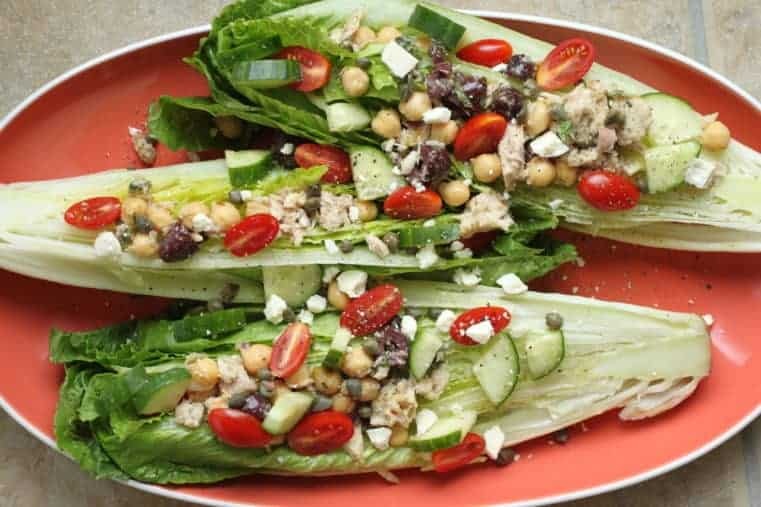 Greek Salad with Tuna and Beans delivers great Mediterranean flavors conveniently! Pour on healthy, delicious, every-bite-has-flavor Mediterranean food. “This taste so good. Plus it tastes like it’s good for you,” said my sister. She’s spot on. And even better? No defrosting required. That’s the ticket for a quick dinner that’s delish and nutrish. With school schedules taking over, The Recipe Redux theme brings us back to the table with innovative food solutions. This protein-packed meal is one we all can agree on. People often tell me they need ideas on how to cook with beans and fish. 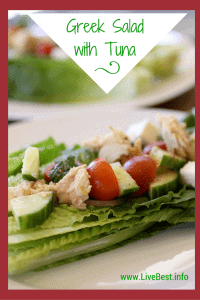 This ramped up Greek salad uses both plus it is fresh, economical, and easy to make. I always keep canned beans and tuna on hand. These are conveniently good convenience foods. Beans are one of the most economical protein sources around. With their high-fiber content, beans are heart smart because they lower blood cholesterol and triglyceride levels and aid in blood sugar regulation. That dose of fiber keeps you feeling full longer. 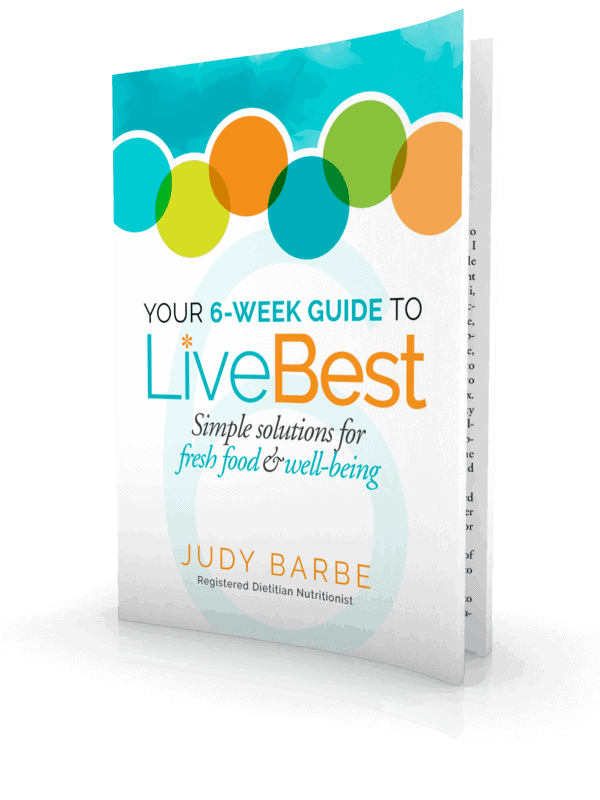 Speaking of fiber, I have a free, 5-day challenge you can join by clicking this link. You’ll get tips and tools, resources and recipes to create your own roadmap to meet your fiber goals. Don’t ya? Won’t ya? Seriously, it’s only 5 days 😉 Find it right here. Per pound, canned tuna is less expensive than many other fish. The fat in fish is the good-for-you unsaturated kind and albacore or skipjack canned tuna are some of the best sources. It’s the fish oils that appear to lower the risk of heart attack, stroke, cancer, and inflammatory diseases such as rheumatoid arthritis. Cucumbers, tomatoes, herbs and salad greens make it refreshingly fresh. I make this in the summer to use all the fresh herbs I have. If your green thumb isn’t working, you can substitute dried herbs in the dressing. Dried herbs are more concentrated in flavor than fresh ones, so use one-third to one-half the amount of dried herbs. So for 1 tablespoon fresh oregano, use 1 to 1 1/2 teaspoons dried oregano. Back to dinner…find the can opener. Marinate the beans and tuna in the dressing for 15 minutes or overnight, however much time you have works. 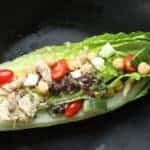 Then pour the every-bite-has-flavor ingredients over lettuce. Feeling fishy? You might like Salmon Zucchini Linguini or these tacos. P.S. 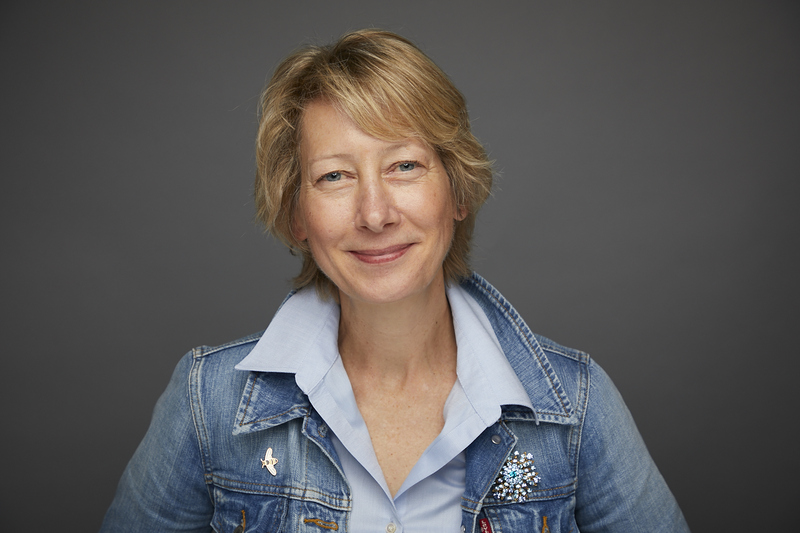 If you’re interesting in more healthy diet tips and recipes, sign up for my newsletter here. 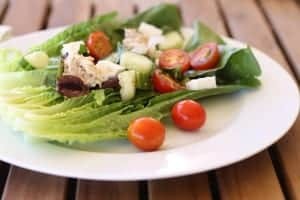 Greek Salad with Beans and Tuna is an easy recipe! 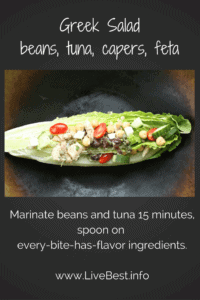 Marinate beans and tuna in the dressing for 15 minutes. Pour on healthy, delicious, every-bite-has-flavor ingredients. Combine beans, olives, lemon zest, mint, oregano, olive oil, capers, cumin and salt and pepper in a medium-sized bowl. Stir to combine. Gently mix in tuna. Refrigerate 15 minutes or overnight to allow flavors to develop. Lay greens on plate. Top with cucumber, tomato, onion and feta, Spoon tuna bean mixture over greens. Side note: I’m a member of TheRecipeRedux. This taste-rules group is right up my alley because they believe healthier eating should always taste delicious. The fun part is that each month features a theme. This challenge was focused on bringing us back to the table. Below you’ll find what my fellow Recipe Reduxers are making or you can follow the conversation on Twitter via #TheRecipeRedux. Minus the olives and I am all over this. Salads are actually one of my favorite meals! I have one pretty much every day for lunch. It’s all in the toppings! I’ll check out your site for some salad ideas.